Thunderstruck, the interwoven stories of Guglielmo Marconi, credited with the invention of the wireless, and Hawley Crippen, a physician, perhaps eventual murderer, isn't Dead Wake or Devil in the White City. I was disappointed that the narrative lacked a strong sense of mystery and urgency. Thunderstruck read more like history than narrative non-fiction, to me. At times it was dry and repetitive. I began to skim the sections where Marconi is testing his wireless, after about the 15th or so iteration of such tests. One reviewer said Larsen “was exhaustive without being excessive.” I beg to differ. I thought Larsen included too much detail about Marconi, his company, his competition, and his endless wireless tests. That being said, I never once considered putting it down. Larson's storytelling is good. He excels at creating a whole picture of his characters ... not just what they accomplished, but their personalities, their foibles, their strengths, their loves, their obsessions. I think he just included a bit too much in this tale. The last 20% of Thunderstruck, the chase for the fugitives, was the page-turner part! I do think Larson's editor should have insisted on a clearer distinction as the chapters shift in time. The Crippen story occurs mostly ten years ahead of the Marconi story until they at last intersect. So, do I recommend Thunderstruck? Yes, with some reservation. 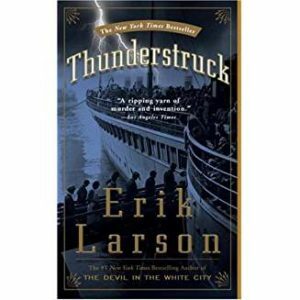 Read Thunderstruck if you particularly like Larson, or you are intrigued by the development of modern-day communication devices, or you particularly like the social and technological leaps and bounds society encounters at the turn of the prior century. Otherwise, I don't suggest this book leapfrog to the top of your list. I agree with you, Andrea, that parts of this book were tedious. I may have skimmed a bit. I found this true in Larsen’s book about the Lusitania. What I like is his ability to intertwine stories.